The economic crisis that we are going through in recent years, has forced almost all of us to redefine our consumer habits, and of course the calibrating a monitor, a tv or a projector could not escape from this rule, even though the particular hobby cannot be regarded as the most essential to our survival! With the release of the X-Rite i1 ‘s Pro2 in April 2012, was almost predetermined what was going to happen. Many thousands of i1 Pro will come out in the coming months for sale on ebay, in a great price range of real values of convenience to outrageously expensive. I believe that some percentage of those who rushed to buy the i1 Pro 2 the first time licensure or to replace their old i1 Pro, hoodwinked by the change in the external appearance of the sensor that did for the first time the X–Rite after many years, thinking that Nicaragua suffered a new, entirely redesigned hardware. The reality of course is completely different, the i1 Pro 2 is nothing but a i1 Pro mounted on new suit. That is why officially from X-Rite, not considered despite the E revision of i1 Pro. So we have come to the current situation, where if someone cares to actually acquire a i1 Pro at a very good price, not only to monitor closely the English and American ebay. The German ebay forget completely, almost all pre-owned i1 Pro sold in Germany come at outrageously expensive prices, our friends the Germans are looking just for suckers! And why would someone looking to buy a used i1 Pro and not buy a new i1 Pro Display (or Display 3 as it is usually called) or a Spyder 4, I wonder? I will not expand on this article, a, and I think the vast majority of those who read the technical articles of Projectorjunkies you are quite knowledgeable, but I will mention just the basic construction difference that separates a Pro Pro i1 i1/2 from a DisplayPro i1 or a Spyder 4. The i1 Pro/Pro 2 is a spectrophotometer optical resolution 10 nm, while i1 and DisplayPro Spyder 4 belong to the category of tristimulus colorimeters, use IE filters to their sensors, with that this implies in the accuracy of their measurements in different types of displays, but also in their resistance to the passage of time (the so-called “ntriftarisma” of the sensor or otherwise varying measurements). 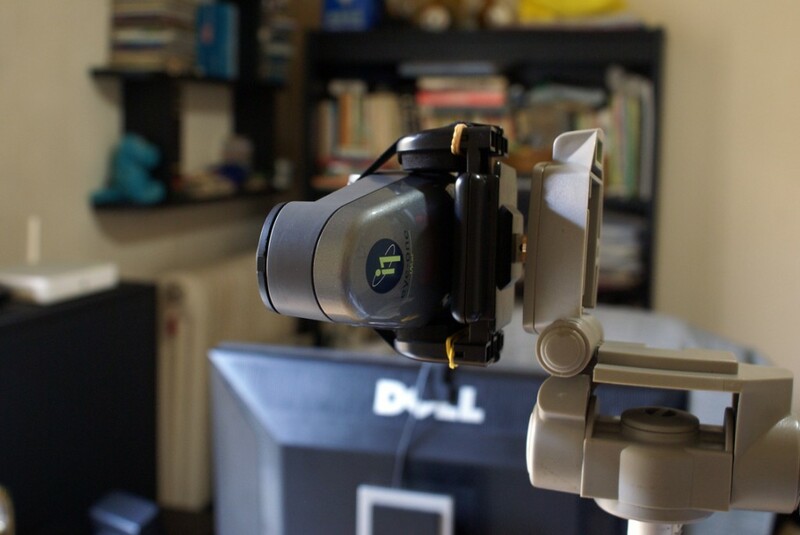 Those who deal fairly or want to get involved with the calibration at a higher level than the strictly amateur, is an open secret: sooner or later you realize that you must acquire at least one second-hand i1 Pro and use either alone, or better yet, in conjunction with a Display i1 Pro or Spyder 4, and to make their profile on the i1 Pro. In this way achieved the benefits of both categories of sensors: a i1 Pro is not doing very well on measurements of gamma and RGB low IRE, usually from 30 and below and is also quite slow in measurements. A i1 Display Pro or Spyder 4 though, that would have been a profile in i1 Pro, combines the precision of the i1 Pro in white and in color with his accuracy at low speed but also the IRE of the measurements. Currently in English but also in American ebay, secondhand i1 Pro are sold at prices from 100-150 euro (really bargains at these prices), usually not the sensors without any accompanying accessories, up to well above the 1,000 euros, if you are going to Publish packages etc. Weigh very carefully the actual needs. If for example, your only need is to calibrate the tv or projector, then you don’t need anything else beyond the i1 Pro and initialize the plate. Download and HCFR in 2.0 that supports him and you’re ready to start! 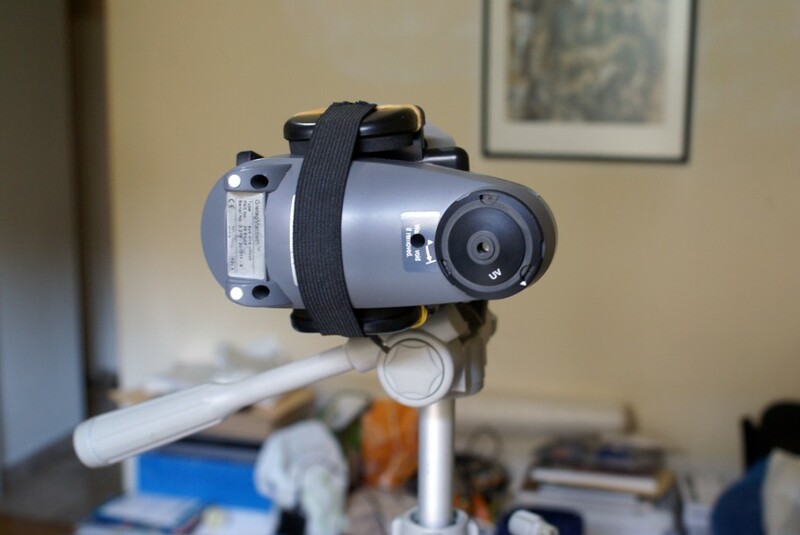 You will miss only one accessory: the so-called tripod holder that stabilizes the i1 Pro tripod for measurements from a projector screen or from a tv LCD or Plasma. The patents that you can do it a lot, here in the photo you see one our own patent for our own i1 Pro. Has used a basis for mobile phone in the car, and a small piece of rubber strap, on whose edges are stitched two small hooks. Most makeshift solution of course, is to fasten the i1 Pro with duct tape onto the tripod (Chachacha, John Hadjigeorgiou solution)! 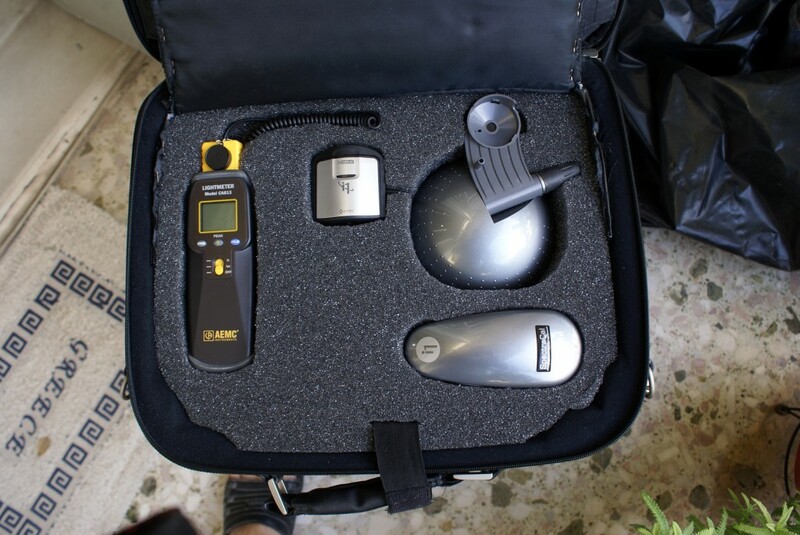 But if for example, you want to use the i1 Pro to calibrate your computer monitor, in co-operation with the analogous software of X–Rite (i1 Profiler) or another, to create the corresponding profile on your pc, then things get complicated. 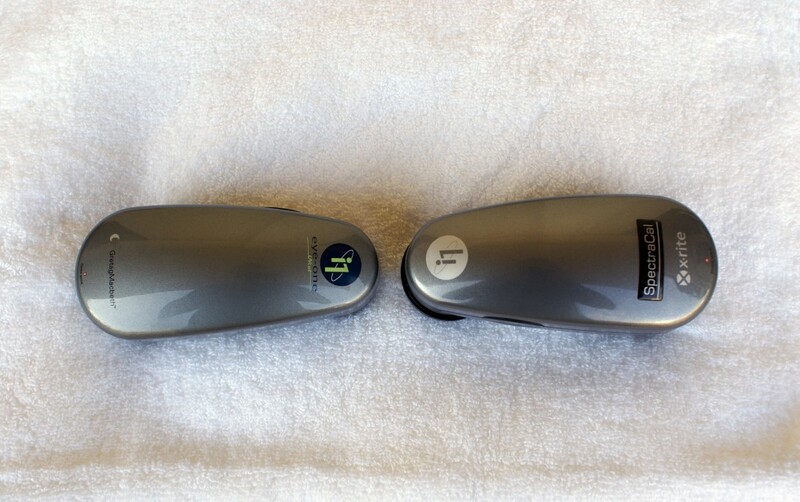 If you buy plain the i1 Pro without the accompanying the licensed i1 Profiler, you’ll find just amazed that the i1 Profiler will not allow you to create and save the profile. If you want to calibrate your monitor with the exclusive use of its own regulatory, and without the help of the graphics card, then there is of course no problem. In this case involved other limiting factors such as insufficient or inadequate regulatory of monitors, especially in the field of color management. Also for a computer monitor, you will realize that you are essentially necessary for calibrating the i1 Pro accessories called flat screen holder, accessory that fastens on a monitor or a relatively medium sized tv, for the isolation of exterior lighting, etc. What do well, if you have ‘ stung ‘ a i1 Pro-price ebay in English scotoma 100-150 euros, but you have come straight, without any accessories? If you absolutely need the flat screen holder, then your options are minimal, and essentially one. The X-Rite didn’t sell plain, as an accessory. For months I have been in European site without find even one that has. With great effort I spotted three American site that they had, but both of them do not send any packages in Europe. All three basically sold in the same price from 70 to 75 dollars. The only one that sends Europe is below, but with shipping price “with my sfaxe Aga agiasw ‘, in other words, most expensive $ 75 from the same accessory! Also, because it would send by courier, chances are that will stick and at the Office, with still about 70 euros charge, apart the hassle that will suffer. So, the best solution is one that we have adopted, we bought it from the shop, but was sent to a known address in America who sent us with simple mail (USPS), at a cost of just 10 euros. Well, we have reached the point that you have in your hands a second-hand i1 Pro in very good condition. Stay away from notoriously abused units, with signs of use, deep scratches or dents, chances are that you will count koykoyroykoy, a and a spectrophotometer can be directly affected by a wallop or a fall from a great height. To begin your journey into the magical world of the calibration, you need a program that will work with him, like HCFR 2.0, which is also completely free. 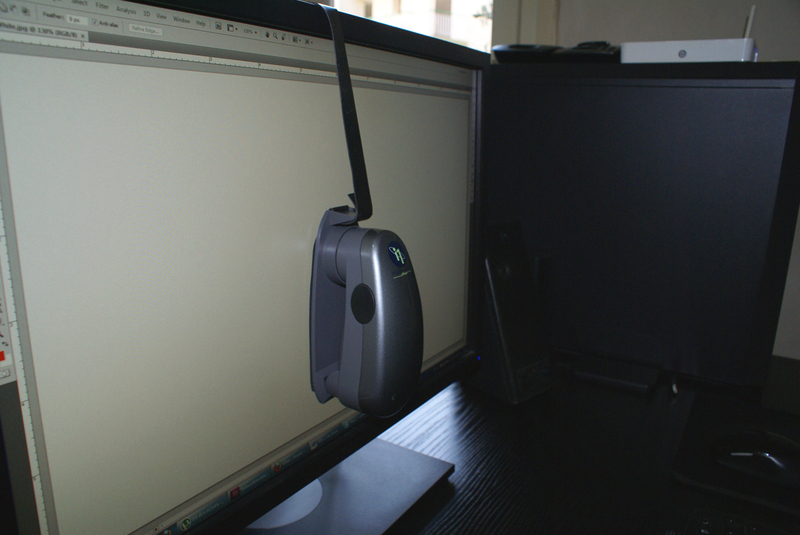 Programs such as the Calman or also ChromaPure cooperate with the i1 Pro, but it is not free of course. Someone who wouldn’t want to allocate extra money beyond the purchase of the i1 Pro, had no choice over the HCFR 2.0. However, our latest suddenly emerged and a second free choice. The Light Illusion, the company that has created the LightSpace, a calibration software launched for sale – calibrators professionals mainly due to very high price – the latest on space, allows you to download for free from the site of a light version of LightSpace to evaluate the possibilities of the program. This version normally collaborates with the i1 Pro, but it seems that has the most potential “locked”, which would normally be unlocked when the program has been purchased properly. However, you can proceed in normal calibration, albeit with greater difficulty, or to take measurements using the free version of LightSpace in collaboration with an i1 Pro. What I thought I, is to compare the measurements of the free version of LightSpace in a very popular program like calibration Calman, when both cooperate with an i1 Pro, and present the results. My aim of course, was none other than to see whether can vary measurements of both programs, when count the same light source with the exact same sensor. And while our site is focused solely on headlights, my first test would be done in a more stable display in terms of spectral behaviour and any changes. So I chose to count with both programs the monitors I have at home, the Dell U2410. An additional element that made me choose the Dell U2410 for my first test, is the fact that it attaches far greater brightness than any home cinema projector and if you choose, with approximately 120 nits brightness in white, while the reimbursed on/off contrast is very small at 500-600:1, so even the very low IRE but still the black would be substantially within the limits of measurement of i1 Pro. 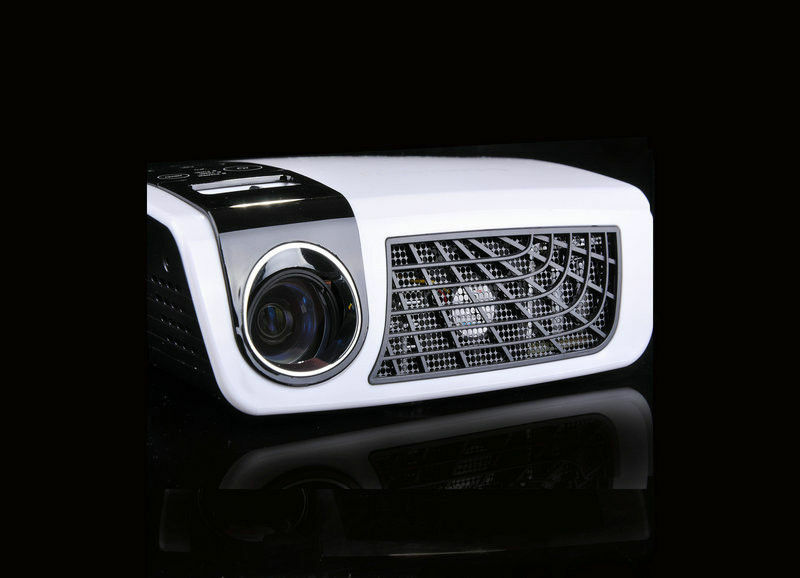 It is understood that later will try to repeat the comparison between the two programs and a projector. The test conditions were the following: The Dell U2410 was in operation for several hours (six over), when measurements were made, so he was now totally stabilized with regard to its performance. Imaging program was in Photoshop and used my own paternakia construction, in order to measure the most common mode on monitors of most of us, that is none other than the classic SRGB. 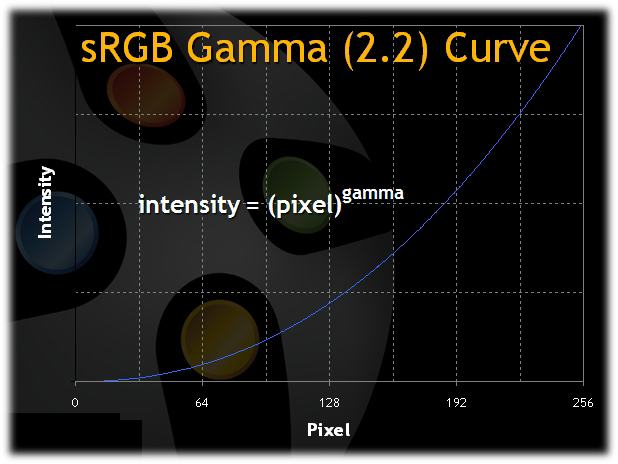 Used well eleven paternakia for measuring the RGB and gamma, from 0% (black) to 100% (white) with an increase of 10%. Also used seven still paternakia for color measurements, the classic 75% brightness, for both the primary and secondary colors, and white. From the main screen Calibrate the LightSpace, could testify that the paternakia that I had made were the perfectly correct digitals, the LightSpace is the only program that lists the correct digitals that must be used in each paternaki. All the paternakia were from Photoshop to the longest possible length and width of the screen, after having pressed control + 0. 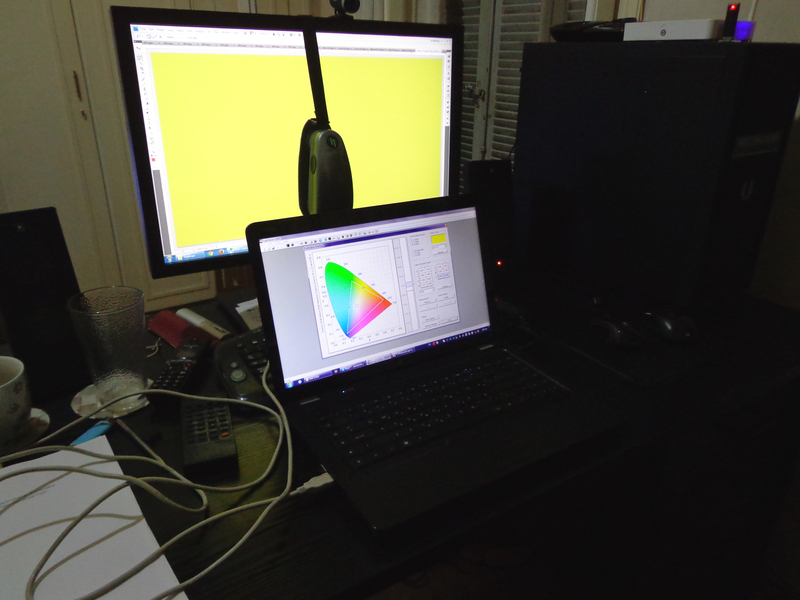 In the photo you see the test conditions with the LightSpace counts the yellow color. Every effort was made by my side, so that the i1 Pro be placed and measure at the exact same point in Dell U2410 and with both programs, in my quest to get out of the equation the factor of color monitor’s display, and to achieve this I used the following trick: the monitor on the back side has a slight edges at the top of the base , which is more than sufficient in size to accommodate the balancing weight of flat screen holder of the i1 Pro. Placing the weight balancing in the center of koyrmpas and aligned with the belt, I ensured the i1 Pro placement at the center of the monitor in relation to the horizontal axis. Then placing the balancing weight in such a way so that it barely touches on the edges, I ensure the placement of the i1 Pro at the exact same point of monitors in terms of height on the vertical axis. It is understood that both programs had selected the SRGB gamut in. Early measurements were made with the LightSpace and immediately afterwards with the Calman. Both programs used one and only initialize the i1 Pro (dark reading). In LightSpace measurements were made as follows: permission to take several consecutive Prona i1 measurements, approximately 6-7 in each paternaki, after sole stop, and did print screen picture of a laptop, and the free version of LightSpace does not allow you to save the measurement data. Started by measuring the white and I descended down until the measurement of black, and soon after followed the color measurements. On Calman I followed exactly the same process, first measurements of white and went to black, and immediately after the color measurements. A and don’t need to make print screen in Calman, finished faster, about 4-5 minutes at most, and the special index in Calman which shows whether the i1 Pro needs a new dark reading was only in 5, while measurements of very low IRE and black made with the special marker in 8 and 7. Keep this as a component will need us then below. 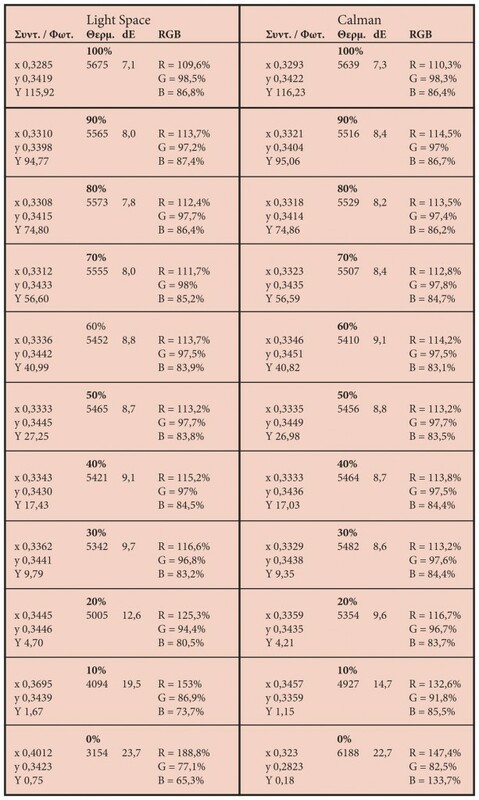 The two analytical tables below we attach benchmarking data from both programs. I’ve put the coordinates (x, y) of each measurement, and the returned to brightness in nits every paternaki. Also indicate the color temperature and the dE v of DE2000 RGB and CIE94 colour during measurements. 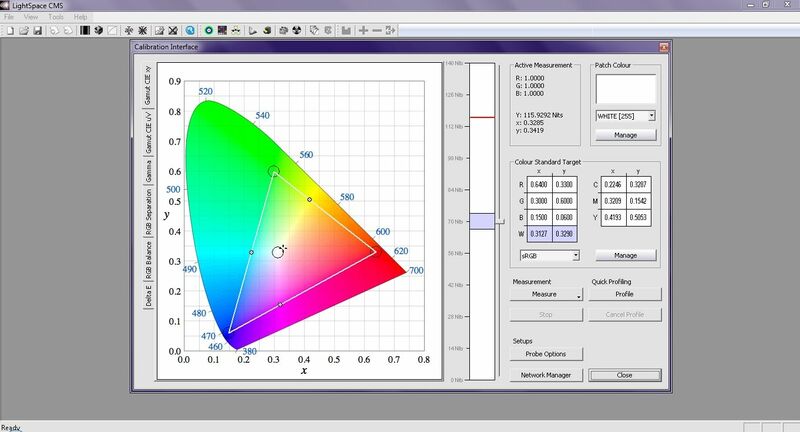 About color temperature, which is generally non-comparable, one and the same color temperature can be achieved with many different combinations of RGB, in the specific case is comparable, because both programs count in the same direction, i.e. towards the very warm, as illustrated by the RGB percentages in the tables. 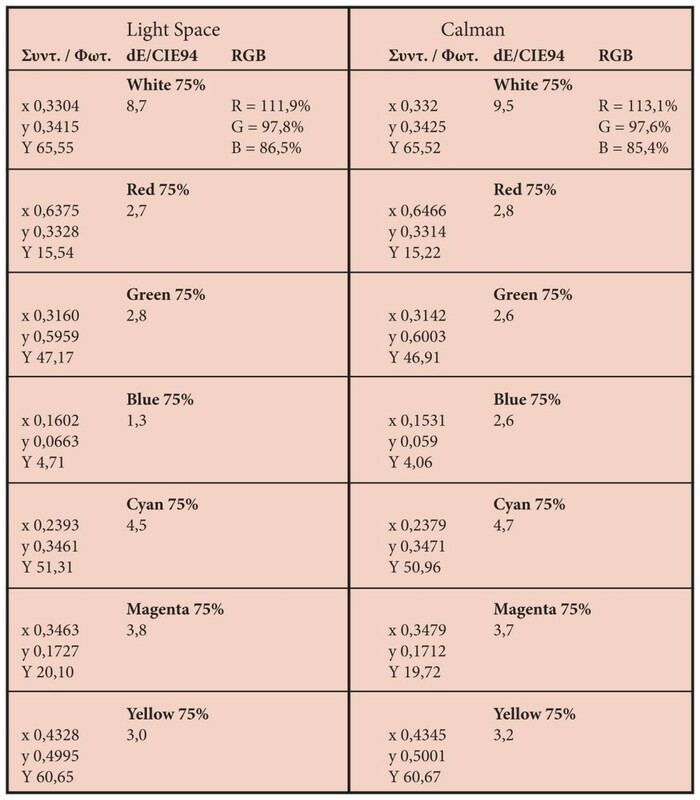 From the tables of measurements becomes easily understood that both programmes essentially the same count in RGB, with very minor differences from the white 100% upto 30% brightness. Their differences are beginning to grow quite at 20%, while culminating at 10% and in the measurement of black. With a known weakness of the i1 Pro in measurements of low brightness rates, these differences are very easily explainable. Nevertheless the Calman seems to exist with “commonsense” and not so intensely extreme deviations, like those observed in LightSpace measurements, at 20% and brightness down. A first element that proclaims it is the measure of the brightness of the black. The LightSpace counted 0.75 whole nits, and whether it was true that number the Dell U2410 should returns just 155:1 on/off contrast! Of course this is not the case, the monitor is measured in multiple reviews and attaches somewhere between everywhere at 500 to 700:1 on/off contrast. Instead, the Calman seems to capture much more of the black brightness in nits 0.18, which brings on/off contrast at 645:1. In the photo you can see the measurement of LightSpace in black. Trying to interpret why LightSpace measurements seem to ‘ escape ‘ more than those of Calman in 20% luminosity and lower, the only logical explanation that seems to be upheld is that only became an initialize in i1 Pro during measurements, but held much more time, at least 9-10 minutes total, because of the screen print process that I had to do While Calman’s measurements were completed within 3-4 minutes. I believe that is that if it had been the second initialize in the i1 Pro on measurements with the LightSpace in very low, measurements of IRE would have approached those of Calman. I will try to repeat the measurements with a second initialize with the LightSpace to confirm. In terms of color, measurements between the two programs are virtually identical, with very minor differences between them, with the sole exception of measuring the brightness of blue, ranging to 14-15%, and this is justified by the very low brightness of the color blue. Regarding the interface of both programs, there is no comparison in my humble opinion, the LightSpace seem to be light-years ahead in relation to Calman in all versions of the series 4.0. In the novice Calman “lost” literally the first few times you will come in contact with the program, not knowing what to do, and would take some time to adjust and to comprehend the different menus and window layout. Quite contrary, I can only give credit to the person or group of people who designed the interface of LightSpace! The menu is very well-understood and ideally positioned, the experienced calibrator won’t need little minutes to seup program and start to kalimprarei, while even the novice user that will run the program for the first time will have immeasurably less in relation to Calman. 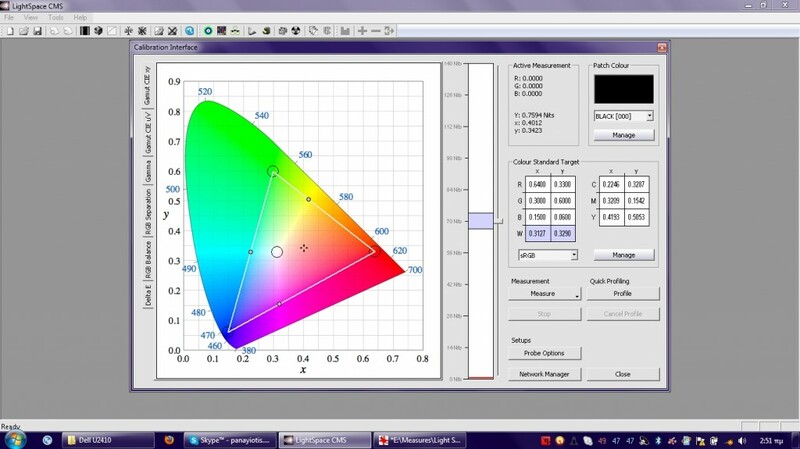 The section of kalimprareis LightSpace Calibrate everything in one single screen, simultaneously and RGB color without change even window other than gamma. Also loved that correctly reflects the LightSpace digitals that should have every paternaki when you set RGB.